Then “Ant-Man” happened, and it was truly the first commercial and critical hit for a movie with Rudd as top billed. When “Captain America: Civil War” hit and his Scott Lang became the runaway hit during that film’s most memorable sequence, Rudd officially hit the big time. After illegally using super hero tech, Scott finds himself on two years of house arrest. He spends his time playing with his daughter, helping manage a home security company with his pal, Luiz (Carlos Pena), and entertaining himself in several other hilarious ways. In fact, the opening 30 minutes of the movie wouldn’t be possible without an actor like Rudd, who will win you over pretty much immediately. All is not well for Hank Pym (Michael Douglas) and his daughter, Hope (Evangeline Lilly). The government wants their tech that allows them to shrink everything, which includes their office building. While constantly on the run, the two of them have built a device to save Hank’s wife Janet (Michelle Pfeiffer), who was long thought to have been dead. The entire movie zips right by as there’s zero filler and every plot move makes sense. It helps that the two protagonists are really well written. Walton Goggins goes with his fantastic southern accent as an arms dealer that can only be described as pure sleaze. However, Hannah John-Kamen steals the show a bit as the mysterious Ghost who is afflicted with an ailment that allows her to “phase” through solid objects. Michael Douglas is clearly having a blast as Hank Pym. He’s essentially an insult comic, firing away at Scott or slamming the rekindled relationship between Scott and Hope. This is the abrasive and charming Douglas that made him a huge star and Reed milks every ounce of it. Rudd knows what he does best and he’s everything you’d expect. What this movie does so effectively is share the hero spotlight with Evangeline Lilly. It’s the first role she’s had in a film that utilizes the potential stardom she showed while on “Lost.” It’s a physical role as she does the same if not more action than Rudd and they make the movie almost a buddy action/romance combo with pitch perfect chemistry. 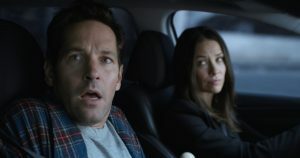 “Ant-Man and The Wasp” is not just another Marvel success, it’s a bonafide riot of an action-adventure. Like “Thor: Ragnarok,” this is a stand-alone story that doesn’t completely tie into the massive Marvel Cinematic Universe. It definitely benefits from that, and Reed gives it a style that makes sense for the off the wall character of Ant-Man. You can’t completely go into this movie without any previous knowledge, but it’s as close as you could get to simply diving in. But if you do just dive in to “Ant-Man and The Wasp,” that ending won’t make much sense and you’ll wonder why 99 percent of the audience just gasped while jaws simultaneously hit the floor. It’s now the most jarring and shocking credits scene that Marvel has done.